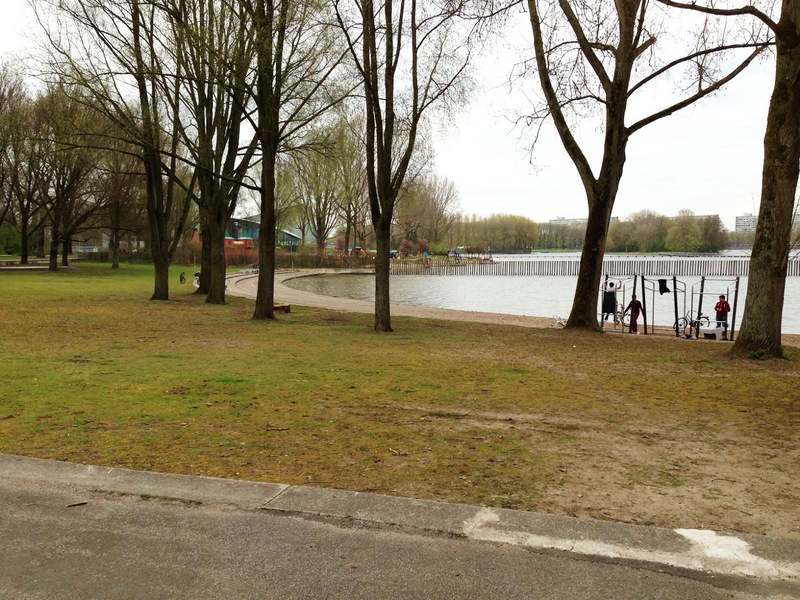 Here's another peaceful park route for Amsterdam. If you are looking for new horizons with lots of water and green parkland, the Sloterpark is a good place to go. 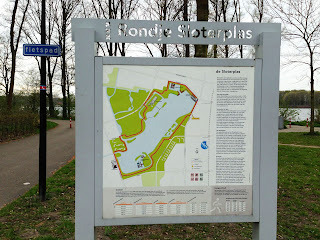 There are a lot of runners and bicyclists there, and a marked trail, the Rondje Sloterplas. Sloterpark surrounds Sloterplas lake on the west side of Amsterdam, located among housing blocks and row-houses. 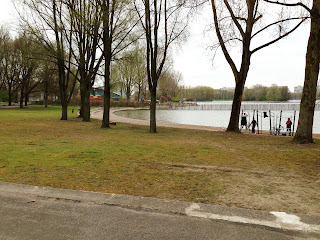 The park is a mixture of lawns and woods, with a few natural shoreline sections, plus a couple of marinas, cafès and a big public swimming area along the western shore. The lake is about two kilometers long and about a half-kilometer wide. 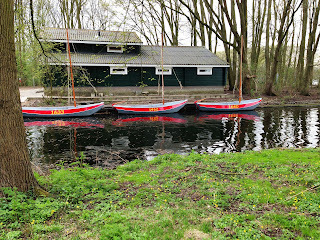 I was working in the nearby Sloterdijk business park this week, near the Sloterdijk Station, and decided to check it out. 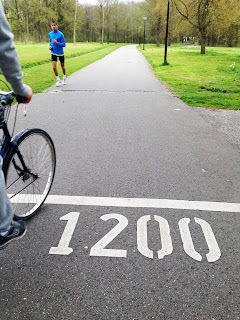 It adds an extra kilometer at each end if you run directly there from Sloterdijk Station. 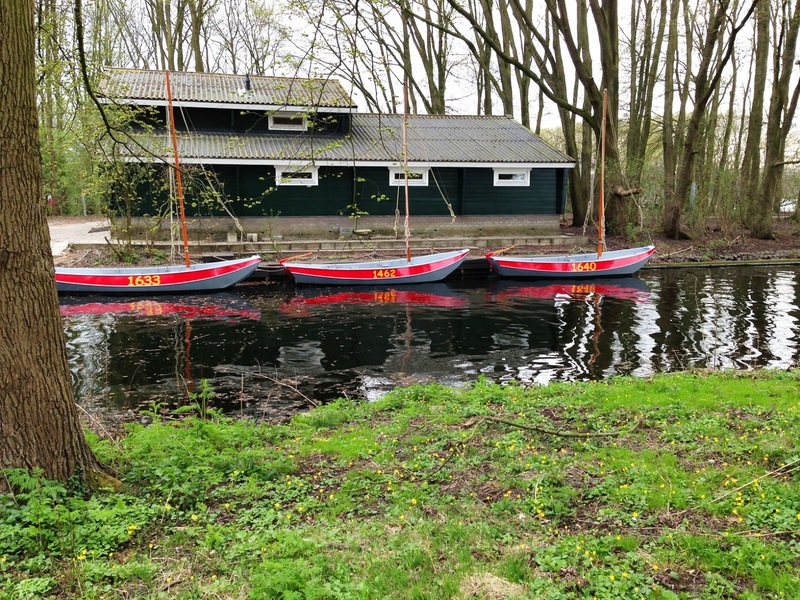 Otherwise, you can easily get to Sloterpark via the metro to nearby Jan van Galenstraat Station, or take one of several tram lines that head out that way. We'll start the run at the northeast corner of the park, at the corner of Jan Evertsenstraat and Oostoever. 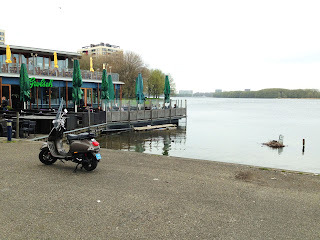 There is a café there, and a terrace along the water. We'll just run clockwise around the lake, with the water to your right side. 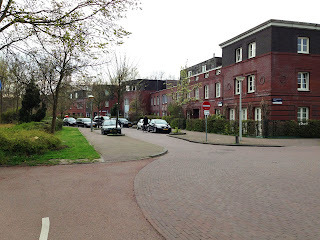 There are parallel paved foot- and bike-trails (as you often find in Amsterdam). The Rondje Sloterplas trail is marked with signs and maps, and every 200 meters a distance marker along the wider bike-trail shows how far you've gone. So off we go, running south! At first, there is just a sidewalk next to busy Oostoever, but after 100 meters, you can turn to the right and head into parkland. Now you just stay on one of the trails running along the water. 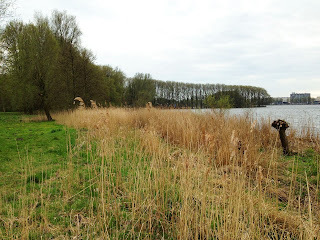 This first section is one of the most natural parts of the park, with reeds growing along the water and even a stork's next on one post over the water. Near the south end of the lake the trail curves to the left to go around a marina. Then it turns northwest to follow the south end of the lake, along Meer en Vaart street. There is another cafè at this end. 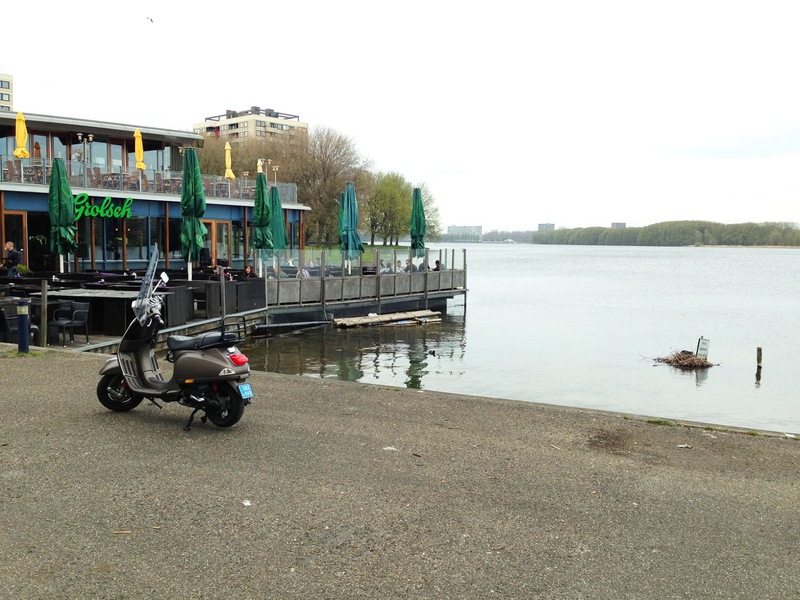 Right after the cafè, you'll go over a canal, and then you need to turn right to continue along the water. Follow the shore until you get to the first bridge, where your turn right again to head north along the west side of the lake. In just a few hundred meters, you'll come to the public swimming area, with its own playgrounds and beach, and a gigantic swimming hall. It blocks access to the water, so you have to run to the left, around the swimming complex. When you pass the swimming hall, you can turn right to get back to the water. You're now almost back to the north side of the lake. When you reach the northwest corner, turn right and head along the north shore back to the start. Thanks for posting this! I integrated this into a longer run and it was really beautiful. I would have never ventured out so far west of the city if not for your post. Glad you enjoyed it, Rebecadk! I will be in Amsterdam again for the next few days and I'll try a route even further out, closer to the airport this time.